There are three national parks or monuments near Rapid City, South Dakota. Millions of people visit Mount Rushmore every year, substantially fewer visit Devils Tower, and very few visit the Badlands. To me, the Badlands is by far the most beautiful and inspiring of the three. I have visited Devil's Tower and Mount Rushmore one each, and I probably will not return. 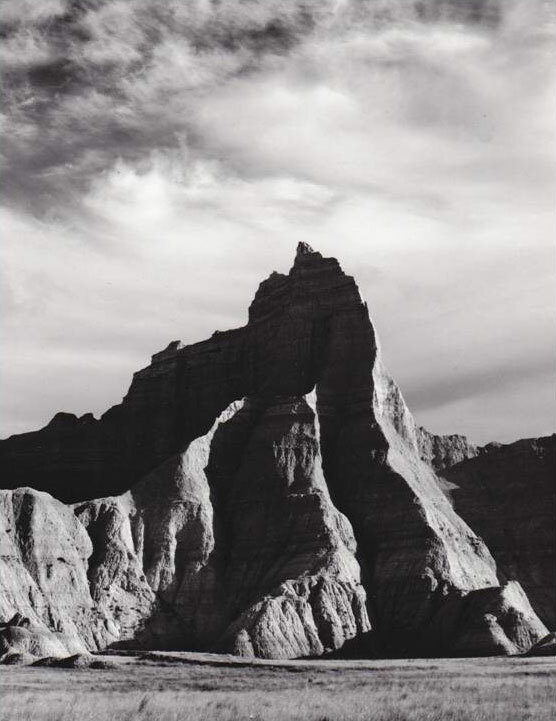 I have visited the Badlands several times, and I hope to visit it several more. This peak, which is a few hundred feet from base to summit, is near the Conata picnic area in the park. To my knowledge, it has no name, nor do most of the spectacular features in the park. I have heard it compared to the great gothic cathedrals in Europe, Perhaps so, but I believe it is the cathedrals that are flattered by the comparison, not vice versa.